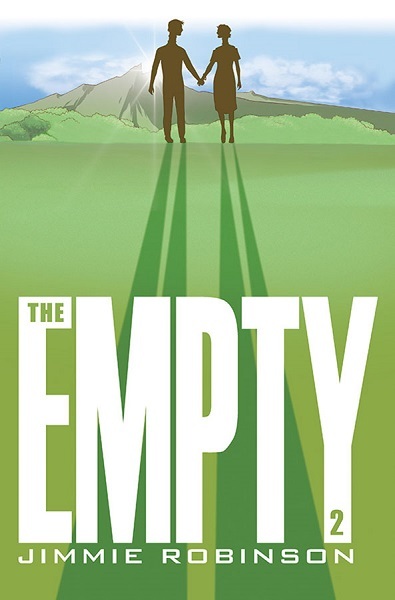 Jimmie Robinson, creator behind such works as Bomb Queen and Five Weapons, recently corresponded with Comic Art Community about his latest work The Empty. Comic Art Community: By the time this interview is published, the second issue of your new series The Empty from Image Comics will have hit store shelves. For those who haven’t yet checked out this new title (or even the five-page preview at Comic Book Resources), what can you tell us about this new universe you’ve created? Jimmie Robinson: We will see the gears of the new world start to unravel for the reader. I’ve hidden a number of secrets in the Empty. Expect some twists and turns. Issue #2 will start the first phase and I will continue that through to issue #4 with another big reveal. These twists are not just in the plot and story, but also in the execution of the art and presentation. Things will actually look different. To be honest this scares me a little. Some of the A-list creators in the comic industry know how to gamble big and get a pay off. Some creators can start their series off slow and build the suspense. Since I’m working on a limited series, I don’t have the luxury of time, however I am taking some gambles, which will be clear in issue #2. Lastly, this new universe will expand, not just in scope and size, but we’ll be adding more characters, too. CAC: In the series thus far, we’ve largely been in the setting of the Empty, a barren wasteland with mysterious poisonous roots wiping out all manner of life wherever they stretch. The Empty features two strong female protagonists in the rugged warrior Tanoor and frail foreigner Lila. In addition to what feels to be a sprawling adventure about to unfurl as the series progresses with an in-depth story of politics and discovery, many have complimented the series for the truly alien design of its characters, landscape, and creatures. Elements of the project draw some parallels to the works of Studio Ghibli (specifically relative to nature and female leads). Was Ghibli an inspiration to you as a creator? Also, I understand The Empty evolved from your short story called “Lila’s Garden” published in Michael Cohen’s anthology Mythography? JR: Yes, I’ve heard from readers and retailers about the creatures and other-worldly direction. I’m happy to read that because I went out of my way to make this as different as possible… but in a way that doesn’t leave the reader in the dark. Often I think some of the best character designs come from small tweaking rather than huge jumps in presentation. 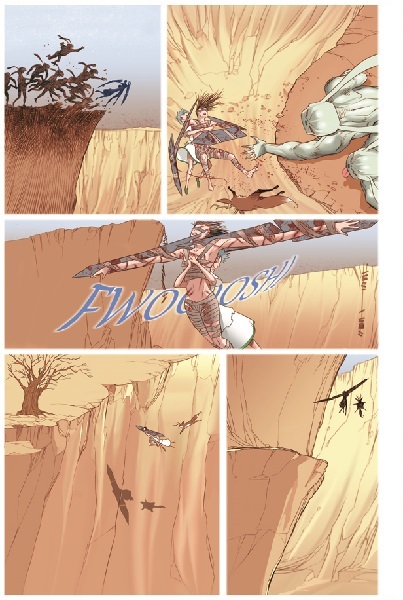 For example, the hunter warrior character, Tanoor, has very long arms. In fact, everyone in her clan / race have very long arms. Other than that they look rather normal. But when the reader sees it looking *off* it spurs a range of questions. Why the long arms? What purpose can they have? Does it affect other parts of their body, etc. The same can be said of the frail farmer character, Lila, with her very long neck. As for Studio Ghibli, I’ve heard the comparisons of *tone* to Nausicaä of the Valley of the Wind — and to be honest I barely recall the story. I’m going to check that movie out again and brush up and see what folks are talking about. Ha ha! However, I do love the female leads in Miyazaki films, so there might be something to that, though being raised by my single-parent mother has probably affected me more. I just like underdog characters. And.. sad to say… a lot of people still consider women to be underdogs. I wish it wasn’t so, but while it works in my favor I’m gonna run with it. And yes, The Empty originally came from an 8-page short comic story I did for Mythography called, “Lila’s Garden.” A LOT has changed from it. I’d say the only real surviving aspect is that the lead character (Lila) can grow things in a world where nothing else lives. That is what called to me in the original story and that’s what I’m trying to do with The Empty. 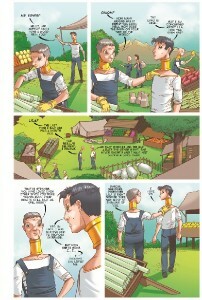 I want a simple farmer, with the power to grow things to be the hero. CAC: In Amanda & Gunn, you went futuristic Sci-Fi. Bomb Queen tackles the superhero genre (or, more accurately, re-examines it). Five Weapons was a multi-layered action series with mystery and comedic elements. With The Empty, it seems thus far to be dystopian Sci-Fi. While multiple genres were the norm for comic books when they first cropped up, since the ’80s superheroes have been the most dominant force in the industry. In recent years, the game has seemed to change in America especially following the breakout success of Robert Kirkman’s The Walking Dead. How do you feel about the evolving landscape of the modern day comic book industry (arguably with Image at the forefront) and what helped you tread such uncertain territory in your creative endeavors? JR: I am really positive about today’s landscape of comics. Since I have the view from about 20 years of being in comics I can really see the difference from the 80s and 90s. Today I can’t even keep up with the sheer amount of product coming out every week. And I’m not just talking print, we have to consider the explosion of the Internet, webcomics, Comixology, print on demand, Kickstarter and other fund raising options. That’s the new core of the industry, but even the stuff that orbits the comic world has been great. Consider all the movies, TV shows, Internet shows, conventions in every region, and public awareness derived from comics. We’re less and less in the closet with comic book culture. It’s a great time to be a reader in comics, or even just a fan. I’m also happy to see publishers responding to the new market. Innovation in character design from Batgirl to Thor to Spider-Woman. We can thank a lot of the independent publishers for that. Image, Oni, Boom!, Dark Horse, etc. Over the years they’ve padded the way for today’s new talent to feel comfortable about producing non-superhero stories. Sure Robert Kirkman is riding the top of the wave, but there’s a whole ocean of creators also working on ideas — who might be the next TV show or movie. Retailers are also changing with the times. More and more Independent titles are being stocked and it really helps — since retailers are the fighters on the front lines. They order our books months in advance, often on just a gut feeling. Image has done well to remake itself yet again. I think this new direction is far more sustainable. 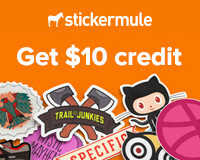 But let’s also remember that Image is a collaboration of creators, not a single entity. So when I say Image is breaking new ground I’m really saying that Jim Valentino is making waves, Eric Stephenson is pounding the pavement, Top Cow is still moving forward, and so on. Just having a publisher that allows you to create freely is a huge part of the movement that helped create today’s landscape. I’ve been especially lucky. Shadowline has allowed me to really stretch my wings. I’ve gambled and lost a few times, but I’m happy that I can keep swinging the bat and even make a small living for myself. However, I’m not one to get comfortable with my few books. As you said, this is an evolving landscape. Just look at Marvel and DC. They are trimming and canceling a slew of titles. They are rebranding themselves and reinventing characters. I’m waiting for the dust to settle on both their universes. Independent titles have made a big impact, but I doubt they can truly fill the void if DC and Marvel were to disappear off the shelf. We need all hands on deck… the question is what those hands will look like in the future. The territory is uncertain, indeed. CAC: And speaking of the future, what does it hold for Jimmie Robinson? I understand The Empty will begin with an initial six issue arc but you’ve already plotted the first twenty issues? Also, while Five Weapons unfortunately ended earlier than expected, sales of the trade collections are doing well? Could there be a one-shot graphic novel in its future? And, of course, likely your best known character Bomb Queen. I remember we spoke before that there’s still a few stories you have in mind (not to mention, speaking of Skybound’s patriarch, Robert Kirkman’s desire to pen a crossover with his creation Battle Pope). JR: The future for me looks like a LOT of hours inside the house, haha! The Empty is now ongoing, I have a supernatural crime mini-series coming out in October (also from Image), and YES I am writing the next Bomb Queen mini-series. As for Robert Kirkman… well, he is a busy man, and most likely he doesn’t recall that gentleman’s agreement we had a long time ago about a doing a crossover with Battle Pope. Another thing I am working on (on the side) is collecting all my old work (which is stored in the basement) and making an art book for conventions and such. I figured I wouldn’t bother my publisher with my old self-published stuff, and it’s so easy to do a print-on-demand run. This way the only person stuck with the bill is me. I have no idea when that will happen, though. A lot of my old art was never scanned. That was back in the days of film negatives and color flats. Not only will I have to scan all this art, but I’ll also be fixing a TON of errors. Many of the pages of my old work were very large. They don’t even fit on a large format scanner. Hahah! In all, I have a LOT of work to do, and that doesn’t count the other ideas I have in my head that I’d like to pitch to companies like Marvel, DC, Milestone, etc. The second issue of The Empty has hit comic book stores and you can find more of Jimmie Robinson’s books online like Five Weapons: Make the Grade, Five Weapons Volume 2: Tyler’s Revenge, Bomb Queen: Deluxe Edition Volumes 1 through 4, and Evil & Malice: Save The World! You can find Jimmie online on Facebook, Twitter, Tumblr, and his website. 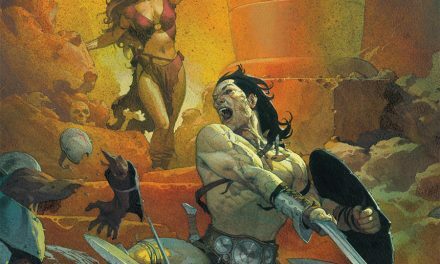 CONAN THE BARBARIAN Makes His Magnificent Return!